I recently enrolled in a photography class at Lander University in Greenwood, South Carolina under their Continuing Education program. I had my first class last night. My instructor is Grace Contreras, an accomplished artist and photographer. I thought that I would be spoon fed on how to use my digital camera…Wrong! Instead, she introduced us to “Critiquing Work”, “Principle of Design” and the “Elements of Art”. Oh yeah, and the “color wheel”. I was told to take my camera off Auto and put it on Manual. I ain’t too sure about all that, but I am going to try. This woodpecker, I guess it is a woodpecker, has been beating on this same hole for over a week now. He or she pays me very little attention to me and shows no fear when I come near. Here is an example of the work by Mud, the student photographer! LOL!!! Please feel free to critique my photo. This entry was posted in Birds, Photography and tagged Continuing Education, Elements of Art, Lander University, Photography by Mud. Bookmark the permalink. Glad to see people still use the color wheel! Itten would be proud. All I know about the color wheel so far is the name, but I am going to learn…we will be using it in class. I sure will…I was looking forward learning about it but now I’m not sure. LOL! It’s and art thing, isn’t it? I think you are getting better already. Thank You for your kind comment…so much to learn! Funny how our expectations can be dashed, I’m sure the class will be filled with info and direction that you will use down the road. 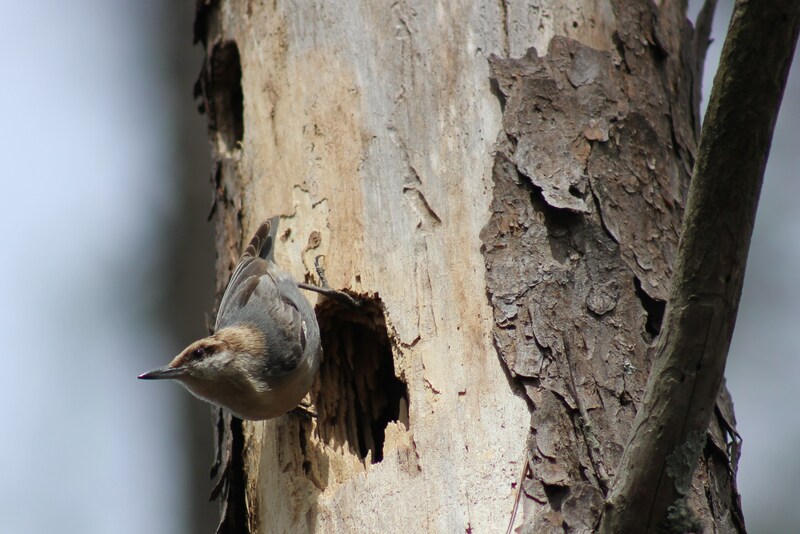 I like the composition of this nuthatch taking a break from poking the hole in the tree. The bark adds nice texture and dimension. So did you use Auto or other settings on your camera when you took this one? I used Manual and took 98 photos. I probably have better shots of the bird, but the hole in the tree made me choose this one to post. To be honest I am kind of excited about learning something about art…”what a photographer thinks about while looking through the lens.” The first class has already made me think about what I was doing while looking through the lens. Shutter speed, F-stop, ISO and everything else will come with time and practice. I may never understand any of it and that is okay because I know I am a better picture taker for taking the class. Thank you for your support and for for clarifying what type of woodpecker I am photographing. I hope as I post some of my photos you will find the time to critque them for me. Any suggestions or help from my blogging friends will be greatly appreciated. Rather than critique the photo I’d like to tell you I think it’s terrific that you’re in taking the class and I love the approach the teacher is taking. Photography is ALL about seeing – pretty soon you won’t be able to look at the world without thinking how you make a photograph of whatever’s in front of you! Keep up the good work and you’re right, the technique will come later. But they would be wasted if you weren’t seeing with an artist’s eye! Tina, thank you for your kind comment and yes, I do understand what you are saying about technique and the artist’s eye. But what is strange, I haven’t taken a photo since the the woodpecker shot. I gotta get busy because I have to show my five best photos and a twentyfour pic portfolio by Tuesday evening. Eventhough I’ve had to take care of other things the past few days my eyes have never stopped scanning for a shot…that excites me. Strangers things have happened. Hope I don’t bore my blogging friends silly, but I have a hunch I will posting a few more photos than before! LoL!!!!! !